Leslie and I were grocery shopping. She wanted little packets of apple-cinnamon instant oatmeal. It’s fast and (relatively) cheap. But I think it’s slimy and involves wasteful packaging. So I bought oats in bulk, and apples for applesauce to stir in. Simmering the apples made the whole house smell wonderful. 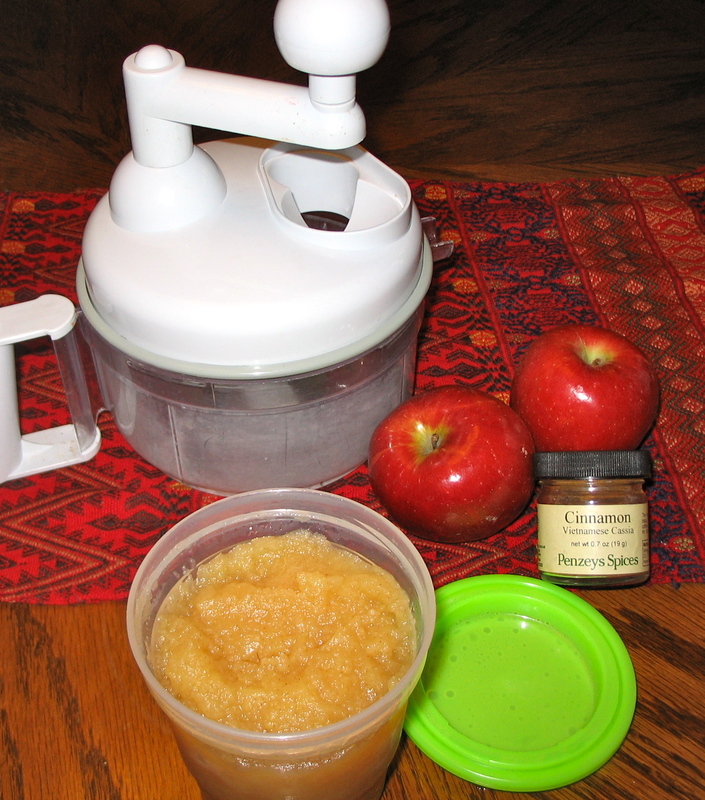 I used the hand-crank food processor we got at the fair instead of the electric processor. It was easy and gave me perfect control over the texture. The sauce is delicious, and the reusable container won’t have to be thrown out or recycled. But Leslie was skeptical, objecting to the time it would take to make “real” oatmeal in the morning. She could have it good and cheap, but not fast. I offered to make it for her because I usually get up first anyway. But it makes me think about the choices, drawbacks and benefits of more mindful living. We have to slow down, be more mindful and adjust our routines. So far, I am enjoying the creativity and higher quality results. This entry was posted in Psychology of change. Bookmark the permalink. You got a hand-crank food processor at the fair? Would that be the state fair? Eco building? I don’t have a food processor and was thinking perhaps I need one. Love the idea of a hand-crank and if I can get it at the state fair, that would be quite perfect. Yes – the Minnesota State Fair. Not sure which building, but this thing really does work well. It has a couple different attachments and blades. We use the electric blender mostly for margaritas. I expect switching to shaved/chipped ice will be one of the LAST conveniences we willingly give up. LOL! This is Leslie. I got it on the first floor of the grandstand building.